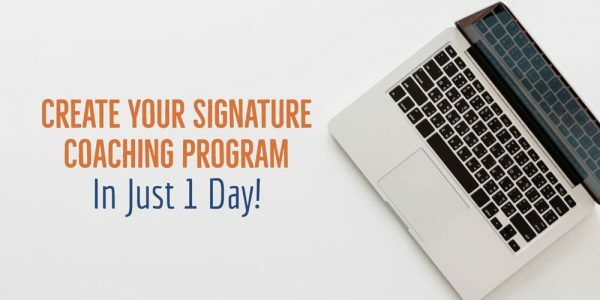 Create Your Signature Coaching Program in 1 day! What do you say when a potential client asks how your coaching works? C) You share your Signature Coaching System… in a clear and concise way that gets potential clients excited to coach with you. If you answered A or B, I’m guessing that attracting and enrolling clients is a bit of a struggle. Well then, let’s change that! Join me next week for a special one-day Virtual Workshop where I’ll be walking a group of coaches through creating their Signature Coaching Program at a fraction of the regular investment. 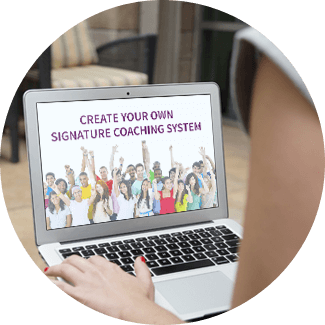 Create Your Signature Coaching Program in just 1 day! …That’s why I decided to run a pilot 1-day Virtual Workshop and offer it at a 70% savings. The only catch is that in exchange for receiving this huge savings, I ask that you complete a short feedback form. => Become a more confident coach. => Help your ideal clients get way better results. => Save time by packaging up your expertise so you don’t have to repeat the same thing over and over again. Join me for this one-time only pilot “Create Your Signature Coaching Program” Virtual Workshop! Find out more about this special opportunity here. This highly experiential “Get It Done” Virtual Workshop is happening next week, so if you want in, don’t wait. You’re going to be blown away by how much you can accomplish in a single day! Since I know that not everyone will be able to attend the entire virtual workshop live, we’ll be giving you the video and audio recordings so that you can choose a different time to go watch the virtual workshop when it works best for you. Plus all of the workshop materials are yours to download and keep so you can add them to your personal Business Success Library. Create Your Signature Coaching Program 1-Day Virtual Workshop <= Get the details and register now.